Last month a little boy, Jack Mackay, aged 18 months, died after being strangled by the cords of a blind near his cot. Now his parents and the NSW Fair Trading Commissioner are warning other parents to look out for dangerous cords, especially when staying in holiday accommodation during the upcoming school holidays. Their advice is just as valid in relation to your own home. 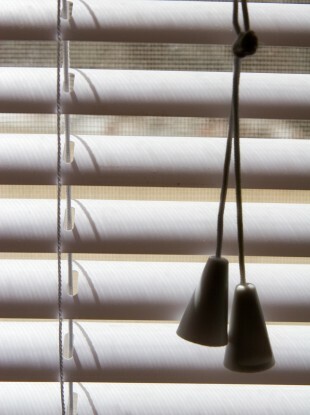 Keep cots, beds and other furniture away from blind cords. Keep cords out of reach, by winding them on a hook or clipping them to the blind. Look out especially for older cords that are looped, or knotted or otherwise joined at the tassels. In most cases these can be made less dangerous by cutting the loop or the join, and fixing new tassels on the cut ends. In some cases a blind might require a continuous loop of cord to work. These cords can be made less dangerous by keeping the loop taut through a cleat fixed to the floor or wall. Cutting through cords and fixing cleats like this are alterations to the property, for which you should properly seek your landlord's consent. As minor alterations, your landlord cannot refuse consent unreasonably. And it is hard to think of any good reason for refusing consent for you to do these very simple things to make your home safer for children. On average one or two Australian children die from strangulation by blind cords each year. The same for less, or more to stay the same?